NICKOLI ANDREWS is I&I Riddim's dynamic lead vocalist. This spirited singer's love for music is rooted in Kingston Jamaica where he was born, and in Westmoreland where he was raised. Nickoli is known for his passionate high energy performances. He is a true entertainer and composer who excites and electrifies his audiences with tunes from a variety of music genres, but his true love is rockin' the reggae. Nickoli enjoys his craft and has spread the love and joy of reggae music nationally and internationally. He has shared the stage with many artists both local and international to include Bunny Wailer and Junior Marvin both of Bob Marley's Wailers. J.J. JOHNSON - John 'JJ' Johnson is a member of the “bassie” team of I&I Riddim. 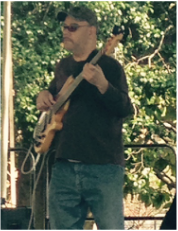 He is a Washington DC based veteran, having been the bass player for Carl Malcolm and the Positive Vibrations during Washington D.C. 's Reggae Renaissance period 1980 -90. Vibes were all over the area, especially around Adams Morgan and Georgetown venues. JJ also toured with Fan Fan and Friends a band that specialize in a jazzy reggae Creole fusion and toured with Determination Band and SEE-I in the earlies. JJ's bassie influences are Robbie Shakespeare, Family Man, Lloyd Parks, and Leroy Sibbles. He has shared the stage with many of the all time reggae greats including Third World, Lucky Dube, Yellow Man, Toots Hibbert, Inner Circle, Ky-Mani Marley, Bunny Wailer, Roy Ayers, Angela Bofill, JJ is most known for his “very cool” attitude and the riddim that serves as the heartbeat of I&I Riddim. Malcolm Hall is a true blessing being the real deal and original bassie for I&I Riddim. Long before immigrating to the US in 2002 from Guyana, Malcolm started his musical journey by playing the steel drum at the age of 5. His first gig was a Christmas school concert where he received a standing ovation when he played “London Bridge.” Malcolm also learned the Brazilian four string Quatro guitar and had grown so accomplished that by age 12 he performed at his church’s local crusades and open air concert. His life then was church, guitar, eat, sleep, repeat. Malcolm also developed an unusual passion for playing bass saying it might touch your heart in a special way. Twelve notes (and God’s grace) can make you happy for a lifetime. Malcolm’s life now as a performer includes church performances as well as performances with other bands. He toured South America, the Caribbean, Canada and the US where he opened for many national and internation acts, including Gregory Isaacs, Bunny Wailer and Junior Marvin. ​ madness. David studied ethnomusicology at the University of Virginia and with Asante Okyerema, the Ashanti royal drummer who played on Paul Simon’s "Graceland" tour. Specializing in Reggae & African music, David has performed at venues including The 9:30 Club, The Kennedy Center, Bottom Line, Blues Alley, and HBO. He has performed with such eminent acts as Big Village, Jamal Millner (Corey Harris/Rainmaker), Chopteeth, King Mensah, & Fanton MoJah. GUEST ARTIST -- Carver Julian, a.k.a. Julian, is a key element in the I&I Riddim Vocal team. Although born and raised in the Soca capital of the world (Trinidad & Tobago) Julian has always been an avid reggae fan. Like many a great singer, Julian got his start by singing in church as a teenager. He was introduced to Bob Marley back in the day whom he came to idolize. 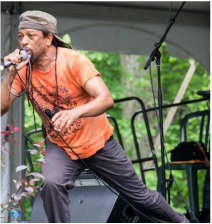 Known in the DC area as the “Bob Marley Specialist” Julian is often a featured guest vocalist for I&I Riddim and adds depth and warmth to the I&I Riddim harmonious vocals. I&I Riddim's TEAM KEYBOARD members provide the riddim of the reggae. regular basis and are talented, professional and a REAL asset to the band. ICHELLE COLE -- Ichelle, mother of four, is an accomplished producer, songwriter, arranger, vocalist and keyboardist in her own rite. Born in St. Ann, Jamaica, Ichelle migrated to the U.S.A. in 1978 and has performed with several groups in the Baltimore-Washington DC area. Ichelle has also filled in as keyboard player backing up Andrew Bees performing live at the Vermont Reggae Festival in 1996 and appeared as backing vocalist and keyboard player with Jr. Marvin of the Wailers. Ichelle can also be heard vocally/instrumentally on several national and local artists productions. Ichelle adds a very special energy and flavor each time she graces the stage with I&I Riddim. You can view more about Ichelle at http://strykersposse.com/. .FRANKIE JAVOIS also is part of the keyboard team of I&I Riddim and performs with I&I on a regular basis. Frankie is from the island of St. Martin and graduated from high school in St. Croix USVI where he played with the Doctor James Talent Club and various local bands. Upon arrival in the US, Frankie formed DKGB Reggae Band and has since been much in demand with all of the local reggae bands. He is currently the leader of the Ewabo Trio and from 2011-2014 was the lead keyboardist for the Original Wailers. He is a true professional in every way and is always a welcomed treat for the I&I Riddim reggae band.